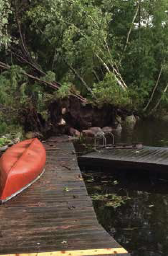 Last summer’s cluster of tornadoes on Moose Pond, Long and Highland Lakes tore up numerous waterfront properties, damaged houses, buildings, and boats. And of course, they also left a wake of shattered trees… Huge limbs broke like toothpicks, trunks snapped in half and whole trees uprooted. Leave the root system in place: The roots provide stabilization along the waterfront and digging out the stumps further disturbs the shorefront. In addition, within 100 feet of the water, shoreland zoning prohibits digging up tree roots. If the roots are lifted vertical to the ground, cutting the tree might allow them to fall back down in place. This type of work is best done by professionals as upturned trees may be under extreme pressure and could be dangerous. When upturned roots don’t fall back down and can’t be pushed back into place with equipment, then talk to the Code Officer, before proceeding. In these situations, the tree root and stump can usually be taken out or cut off with proper permitting. Allow a tree to grow back near the one that came down: Trees are the filter that keep Moose Pond clean. If you want the clarity and quality of Moose Pond to remain pristine, the shoreline needs to remain forested. On developed lots without any seedlings, a tree may need to be planted nearby. Aside from more infiltration of stormwater (mature trees can absorb more than 100 gallons per day), you will also gain privacy, shade and habitat for the creatures that frequent the riparian zone. Let impacted areas grow back: Cutting and cleaning up downed trees often means large equipment and temporary, necessary disturbance. After the equipment is gone, let vegetation that was disturbed grow back. Low and medium vegetation around the water is resilient but only if you leave it alone. Don’t let damage control be simultaneous with lawn expansion. While your property can never be tornado proof, it is important to understand that trees growing next to each other are more resilient to high winds than those standing by themselves or in heavily thinned woods. For your safety alone, this concept is worth remembering before thinning around the water. Still have questions? LEA staff are happy to make site visits or discuss vegetation standards and best management practices over the phone at 207-647- 8580.